This young lady had a large gap between the front incisors. Her upper lip was ‘falling in’ and creating an unattractive contour. Two baby teeth are also present. 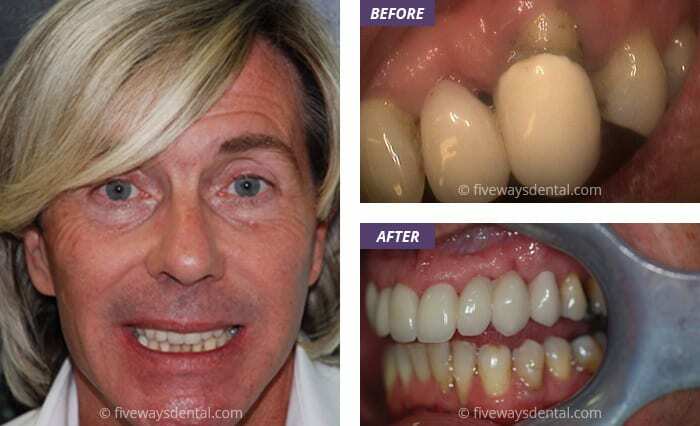 Our dentist placed veneers on the four front teeth. The baby teeth were built up with white filling material. Notice how the lip is now well supported after the best treatment for smile makeovers Liverpool has to offer. This gentleman was unhappy with the colour of his teeth. He also felt that the his lateral incisors were too small and prominent. 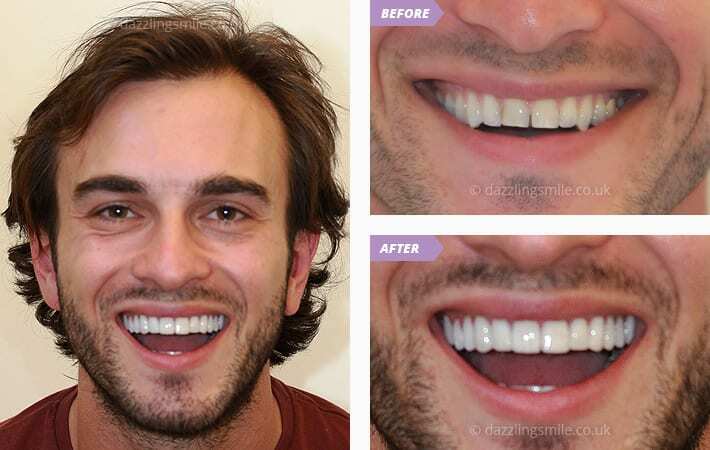 A combination of porcelain veneers and bleaching has created this dazzling smile! Helen had previously had her front four incisors veneered. 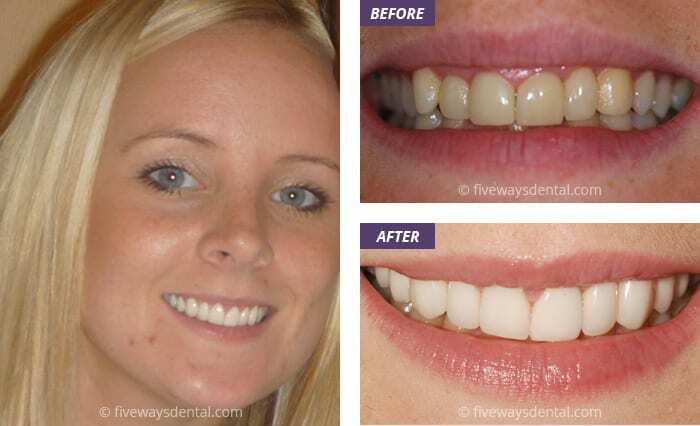 She was unhappy with their unnatural appearance and wanted a wider smile line with less gum showing in her smile. Our dentist painlessly recontoured her gum levels with our laser and following the ultra-quick healing from using this recontouring method, Damien placed ten veneers to completely transform her smile. This lady was concerned with the irregular and crowded appearance of her teeth. She did not wish to undergo orthodontic treatment so our dentist placed a combination of veneers and crowns to produce this new smile. This patient had a very neglected mouth and the teeth were worn down through acid erosion. This patient was very nervous and after intense cleaning to improve the gum condition, veneers were placed on the front teeth while crowns (Zirconia) were placed on the posterior premolars. Unfortunately, the patient has gone back to smoking heavily and the lowers have yet to be treated. This young lady was concerned with the gaps between her front teeth. 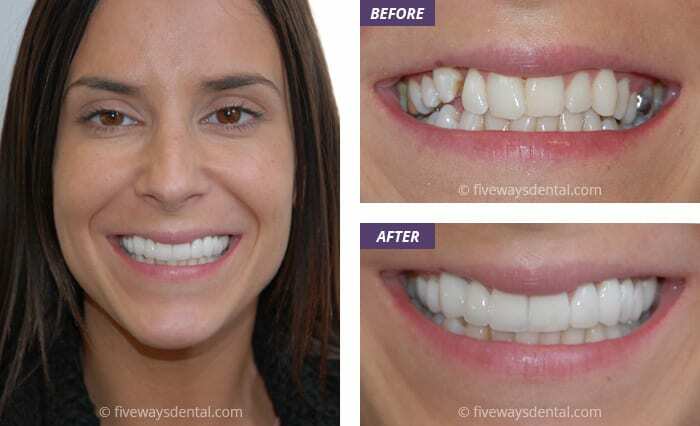 We treated her conservatively with porcelain veneers to create an extremely natural and aesthetic result! For this patient we extracted the instanding lower tooth. He wore an orthodontic appliance for six weeks before our dentist prepared and fitted veneers on eight upper and seven lower teeth. This lady was unhappy with the colour and uneven shape of her teeth. We treated her with a combination of veneers and bleaching to produce a beautiful smile. 1 hour teeth bleaching on its own – no matter what is used – does not produce brilliant results. Use bleaching trays at home for 2 weeks and bleach 30-40 minutes twice a day. Undergo Zoom2 bleaching in the surgery within a 1 hour 15 mins appointment. Bleach again at home for 1 week. Bleach again at home for 30 minutes, once a month, to maintain the result. Without maintenance, teeth will return to their original state due to natural staining of food and drinks, especially from tea, coffee, wine, etc. 2 implants were placed and the natural smile restored. This young man presented with an abscess and swelling over his front. After extracting the root atraumatically, bone graft was used to replace the destroyed bone due to the abscess. Three months later, our dentist placed a dental implant. A further two months later, a crown was placed to restore his appearance. 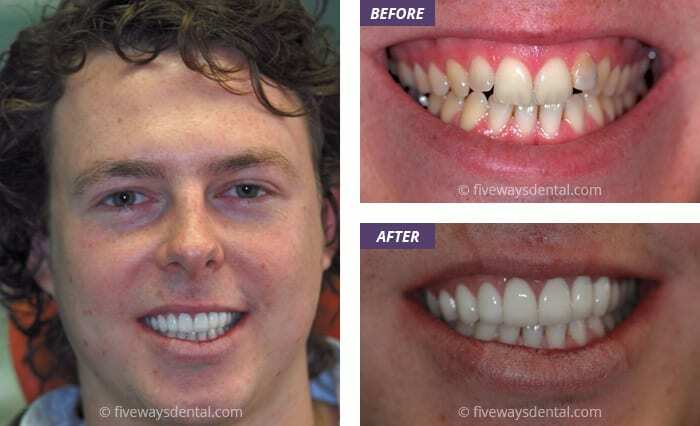 This young man had lost a lot of his teeth during his childhood and wore a plastic denture that he hated. He also had four upper front teeth crowned by another dentist but they were of poor appearance. 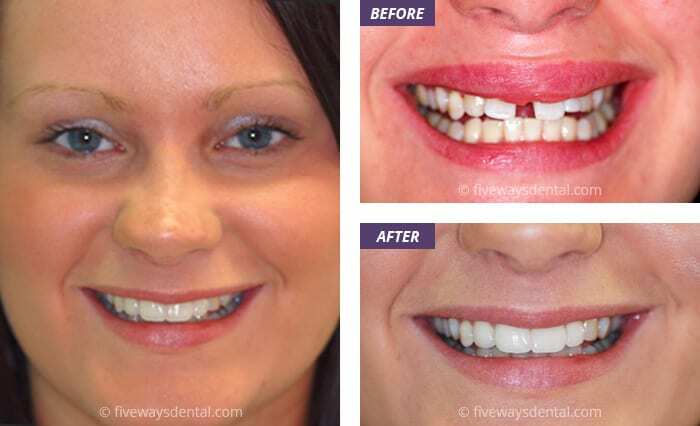 Our dentist placed several dental implants with fixed bridges and new crowns were constructed. This young man presented with an abscess and swelling over his front tooth due to a vertical fracture of the root. This young girl complained of “bent teeth”- meaning the teeth on the upper left looked normal in length and ones on the right are short, so when she smiled she showed too much gum on the right hand side due to short teeth. Upper right teeth lengthened with laser by cutting away excess gum tissue. This is 5 minutes after the 10 minute operation. Click here to find out more about our payment options.